Recommended to me by a friend, I met Rahelio this past February when traveling out west. I signed up for a ceremonial sweat lodge in his backyard. I had no idea what this would entail, but i had my husband drop me off to his house in the middle of the Sedona desert, and as it turned out, it would be one of the most beautiful experiences of my trip and quite possibly my life. About 10 people crawled into a small yurt with a hole in the middle for our legs and for the wood burning chimney. Sitting in a circle, perched on the edge of earth, we started by offering tobacco to the fire to symbolically burn ignorance, ego, and other negative qualities or thoughts. In the pitch black, we went around praying for loved ones, the planet, and said very personal prayers from the heart. My whole life I have been taught to pray and have come to know the power of prayer. But prayer out loud, directly from the heart with no memorized script... in front of other people?! This was a whole new ball game for me. As the ceremony continued, Rahelio poured water and tea tree oil on the fire place and the yurt got hotter, I could feel we were about to do some serious energetic shedding. 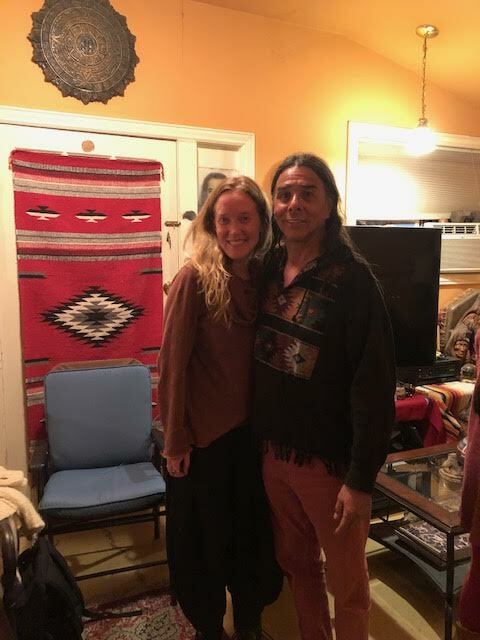 In the darkness and in the steam, he continued to lead the most beautiful satsang imparting us with the wisdom and teachings of Jesus, the Buddha, and the native Americans....often breaking into Native and Celtic songs, while his son played the crystal singing bowls. He said something that night that really stood out to me, it was an Aha moment of sorts. When I got back to the yoga center at home, I immediately shared it with my students. It was surrounding the idea of positive affirmations, and how so many people are using them. Personally, I love them, and I often mention them when giving lectures on the art of positive thinking and meditation. To practice, you would affirm out loud the qualities which you wish to bring about in your life. For example: Freedom. "I am free. I walk on this beach as free as the birds. Freedom is my birthright, it is in my heart, I am free here and now" It can be such a beautiful practice! ...but there's a catch, If you are feeling the vibration of freedom in your being and you affirm it to the universe it lights you up like the fourth of July! Like attracts like, and you will continue to move forward embracing cultivating and living in this positive vibration! However... if you are not feeling the energy of that which you are trying to cultivate - it won't really do much at all. You have to meet yourself where you are at. So instead of affirming that which you would like to become, PRAY. For example, "Great Spirit, Lord, The Universe... Show me the path to walk in freedom and beauty. Help me to become a more courageous person. Help me to embrace the essence of my true self .... joy, wisdom and peace " ... Then as always, be careful and be ready ... The university of life has very special ways of teaching us! The sweat lodge experience was a total purification for body, mind, and heart. I intimately bonded with the souls of the 10 people who were there that night even though I could not see their faces. When it was over a majority of the people made the mass exodus to get fresh air. I took my sweet time, I didn't want to leave or for this experience to be over just yet. There was one other woman sitting next to me who felt the same way. As we sat there in the dark she asked if she could kiss me. I was SO taken back and surprised by this...I am a New Yorker after all … but in this particular moment I said sure. She kissed me on the head and said thank you for sharing your beautiful heart with us. We emerged from the lodge shiny new people with lighter hearts and expanded visions.